Your step-by-step guide to Slashing your monthly TV Bill by 80%... or more! 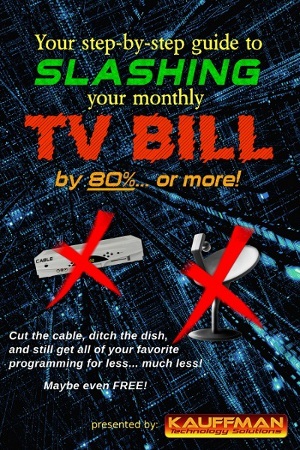 Cut the cable, ditch the dish, and still get all of your favorite TV programming for less... much less! Maybe even completely FREE! Put $100 or more into your pocket every month. Cut the cable, ditch the dish, and still get all of your favorite TV programming for less... much less! Maybe even completely FREE! This 46-page guide will take you through each step with detailed instructions on how you can put together your own system for receiving all of your programming at little or no cost. With charts, diagrams, and pictures. Includes cost analysis so you can figure out exactly how much you will save every month. Hundreds of thousands of people are "cutting the cord" every year and putting up to $100 or more in their pockets every month... now you can join them! Anyone can do it, we show you how.